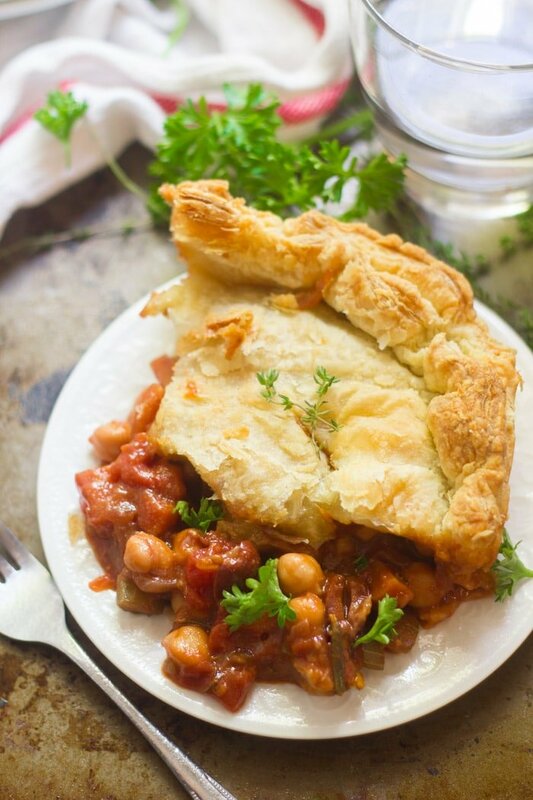 A savory mix of herb and wine simmered chickpeas, veggies and olives is stuffed into a puff pastry crust and baked to flaky perfection to make this hearty vegan ragoût pot pie. I while ago I had a reader ask about my tempeh ragù recipe. Shouldn’t that be ragoût" To be honest, I wasn’t sure. I had a momentary freak out over the possibility of naming my recipe after a familiar brand of jarred pasta sauce. It’s okay though. I Googled around and from what I understand, they’re two different things: a ragù being a meat sauce, and a ragoût being a kind of loosely defined stew with lots of stuff in it. Anyway, that’s sort of what Food & Wine had to say about the issue. So I added ragoût to my list of things to make. And since ragoût is so loosely defined, I threw in all kinds of stuff, basically making it up as I went along. Oh, and I turned it into a pie, because pie. If you’re not down with the pie thing I’m sure this would be great over pasta or polenta, but I loved it as a pie. So let’s talk about this pie. This is not like grandma’s chicken pot pie. If you’re looking for that (in vegan form, obviously), go here. My ragoût pot pie has a lot going on, flavor-wise, between the veggies, chickpeas, tomatoes, herbs, wine, and oh, olives! It’s intensely flavorful and super comforting, in a different kind of way than vegan chicken pot pie though.